>> The 5 Different Types of Rifle Shooting Stance | Why It Matters? It can be easy to lose sight of your rifle shooting stance anytime you’re hunting or at the range. Although it may seem unimportant, it is the basis of every shot. No matter how great your technique is, if you don’t master a stance, your shooting will suffer. Here, we’ll tell you everything you need to know about the basic stances and help you find the right stance. When you are shooting, everything starts with your stance. It’s the foundation of every shot, and an improper stance can lead to inaccuracy, as well as added strain on your body. 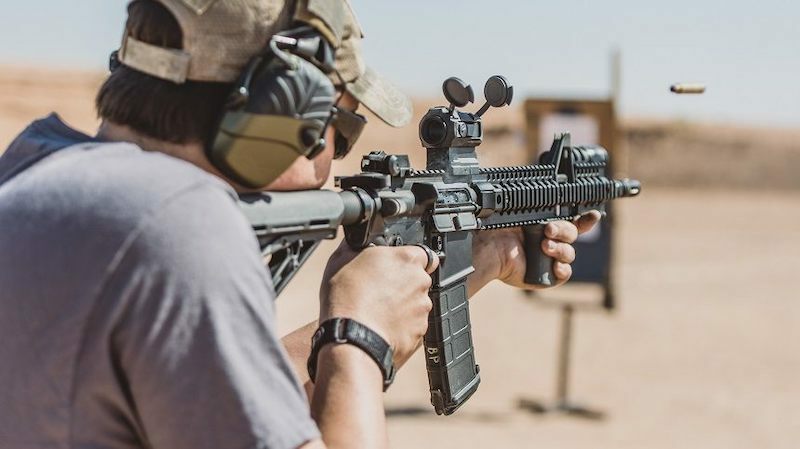 By properly setting up your body and aligning your firearm, you’ll be able to maximize accuracy, as well as absorb recoil without causing yourself harm. It’s always important that you know the right situation for a certain stance. By recognizing how each stance can be used, you’ll develop into a more accurate shooter and keep your body safe from the recoil of even the ​best air rifle. Here, we’ll give you the basics of the different shooting stances and how to find the right stance. There’s no one stance that will be best for every situation and shooter. Consider what type of shooting you will be doing before choosing a stance. And it’s always worth trying out multiple stances before you decide which one to be your go-to. You will also benefit from mastering multiple stances. This is the classic shooting stance, used widely for years as the standard for new shooters. And there’s a reason why- it’s a reliable, easy to learn stance with great accuracy. The arms are extended forward, with the feet aligned and planted firmly at shoulder width. The knees are bent slightly, with a slight forward lean. You should face forward, with the firearm directly in front of you and your toes pointing straight. It’s an easy stance to learn, making it an excellent choice for beginners. Many shooters find it to be a natural stance, as well as a comfortable one that puts little strain on the neck. One of the fastest stances. Requires less practice than other stances, so there are few reasons not to use this stance. Despite its simplicity, it’s an accurate stance. It doesn’t absorb recoil well, which can lead to some balance issues, especially with repeated shots. The stance has great side-to-side stability, but the weight isn’t as well distributed front to back. Doesn’t work well with long guns. Not a very mobile stance, making it a poor choice if you need to move around. This technique, developed in the 1950s, has become a standard in recent years due to its stability and versatility. The non-dominant foot is forward and the arms are bent at a slight angle. The knees are bent slightly and the back is kept straight. It’s an excellent all-around stance that is quick to assume and gives you great accuracy. Excellent protection from recoil, as the weight is well distributed from front to back. This means it absorbs impacts better than the Isosceles Stance. The smaller profile makes you less of a target. With better weight distribution, it may be easier on your arms and neck. A quick stance to assume, so it’s great in situations where you need to be at the ready quickly. The unlocked elbow of the support arm means the firearm is closer to you, which makes it easier to aim. Moving from side to side can be more restricted than with the Isosceles Stance, which can make it difficult to track a target. Not a good stance for cross-eye dominant shooters, as it can be hard to look down the length of the firearm and aim. Recoil can put extra strain on your wrists and can cause harm if you are not properly braced. You have to move your head more to survey the area around you, so your response time could be slower. This stance is a blend of the Isosceles and Weaver Stance. One foot is forward, but not as far as with the Weaver Stance. The shooting arm is fully extended, but the support arm is bent. The back should remain straight. It’s a dynamic, active stance that is excellent for controlled, accurate shots. 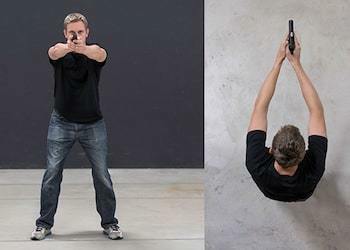 Absorbs recoil better than the other stances, as the shooting arm is fully extended, which serves to absorb the impact. If you are a cross-eye shooter, the opposite eye is more in line with the firearm, allowing you to more easily aim. It’s a bit more relaxed than the Weaver, so it puts less strain on your body and feels more comfortable. Requires less upper body strength than stances where both arms are fully extended. Your foot is not as far forward as it is with the Weaver Stance, so you may be able to move more easily. Considered the most accurate two hand stance. There is not as much freedom for side to side movement, which can make tracking a target difficult. 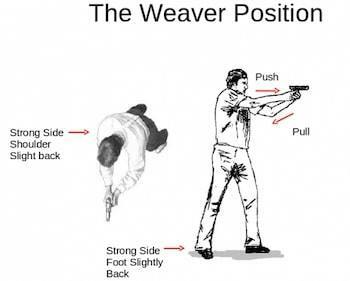 It’s slower to assume than either the Isosceles or Weaver Stance, so it’s not a great stance if you need to be ready to fire quickly. Field of view isn’t quite as good as it is with front facing stances. Since your feet are narrower, your balance may not be as good and can make it hard to stay in the stance if you are using a powerful round. Sometimes, you may not be able to use both hands to wield your firearm, but you still need to protect yourself. In that case, the Power-Point stance is your best option. It will give you decent accuracy at close range and is a great stance for self-protection situations. It’s also highly mobile, allowing you to stay accurate as you move around. One of the best stances for when you only have access to one hand. Despite only having one hand free, it still gives you decent accuracy at short range. 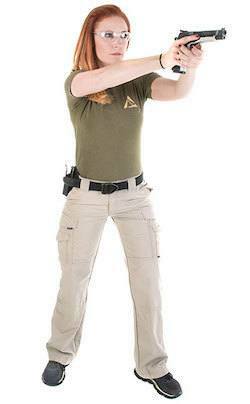 One of the quickest stances to assume, making it excellent in cases where you need to be ready to fire quickly. Very mobile stance, allowing you to move around and still be prepared to fire. Can be used with either hand, so it’s flexible, depending on what side you want to face. Not the most accurate stance, as you don’t have a second hand to support the firearm. With only one hand supporting the firearm, it’s not a good stance to absorb recoil. Since you only have one hand on the firearm, recoil could cause damage to your wrist and even cause the firearm to hit your face. This stance, like the Power-Point Stance, is meant to involve only one hand. However, here the firearm is held out to the side, rather than out front. This is to protect it from an assailant. It’s a great stance for situations where you don’t want to lead with a gun, such as when walking around a corner. Quick and easy to assume, making it a great stance for self-protection purposes where you need to be ready to fire right away. Keeps the firearm shielded from assailants so that you won’t be disarmed as you come around a corner or open a door. Still gives you decent accuracy at close range. Foot placement isn’t important, so it’s one of the most flexible stances, and great when you’re on the move. Since the firearm is at your side, firing is slower than it is with other stances. Without two arms to brace, recoil absorption is not as good compared to other stances. Less accurate than the Power-Point Stance, as you are not ready to aim with the firearm out front. There’s not one stance that will be best for all shooters. Here are some tips on how you can find the right stance. The stance you choose will often depend on who teaches you. Different instructors will favor one stance over another. Try to learn as much from them as possible. There are multiple good options when it comes to stances, so don’t worry too much if your instructor uses a different type than what you expected. As long as you are taught well, it should still be effective. If you are a cross-eye shooter, you may want to consider a stance that will make it easier for you, such as the Chapman Stance. Otherwise, aiming may be difficult and your accuracy could drop. By choosing the right stance, you will be able to properly aim down the sights. You can also prefect your shots by reading this article on how to shoot an air rifle accurately. Don’t assume that the first stance you try will be the best. Try a few different stances before you settle on the one that is right for you. You should choose the stance that is the most comfortable for you. Don’t worry if everyone around you is using one type of stance. What’s important is that you have a stance that feels natural. Practicing your rifle shooting stance can have a dramatic impact on your accuracy. It’s a simple but effective way of making yourself a better shooter and keeping your body safe. 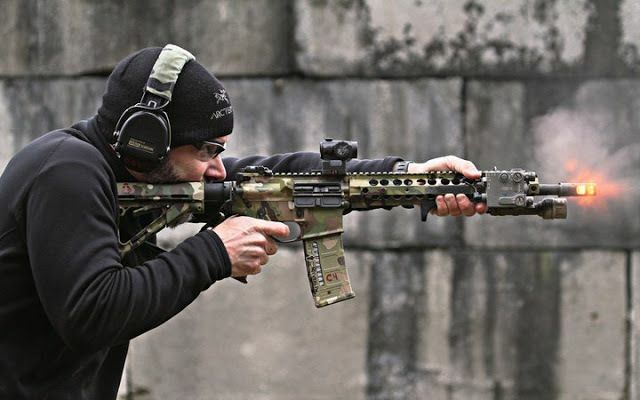 Finding the right stance can be tough for many shooters. There are a lot of different stances out there, making choosing one difficult. Fortunately, with our guide, you’ll be able to find your perfect stance.